What is the CODE Function? The CODE Function is categorized under Text functionsFunctionsList of the most important Excel functions for financial analysts. This cheat sheet covers 100s of functions that are critical to know as an Excel analyst. It returns a numeric code for the first character in a given text string. The returned code corresponds to the character set used by our computer. The Windows operating system uses the ANSI character set, whereas Mac OS uses the Macintosh character set. As a financial analystFinancial Analyst Job DescriptionSee a real Financial Analyst Job Description including all the skills, experience, and education required to be the successful candidate for the job. Perform financial forecasting, reporting, and operational metrics tracking, analyze financial data, create financial models, we may not use this function as often as the rest, but we need to understand it if we intend to master Excel functions. Text (required argument) – It is the text for which we want the code of the first character. 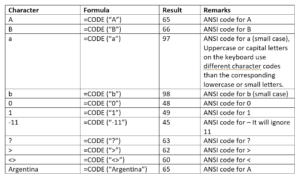 Excel uses the standard ANSI character set to return the numeric code. If there is more than one character, then it will take the first character and provide the ANSI value for it and ignore the rest of them. How to use the CODE Function in Excel? 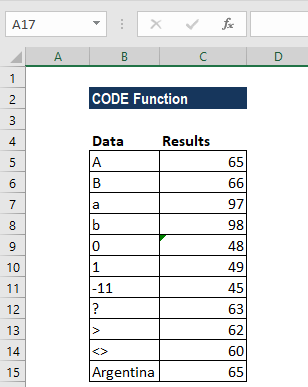 As a worksheet function, CODE can be entered as part of a formula in a cell of a worksheet. We can also use the UPPER and LOWER functions along with the CODE function to get the desired results. If we use the function by providing a reference to a cell, it should not be in inverted commas. VALUE# error – Occurs when the text argument is left empty. The CODE function will give the result as a numerical value. It was introduced in Excel 2000 and is available in all versions after that. The CODE function is the inverse of the CHAR function. Excel functions CHAR and UNICHAR will return the character for a given code whereas Excel functions CODE and UNICODE will do the opposite – give the code for a given character.